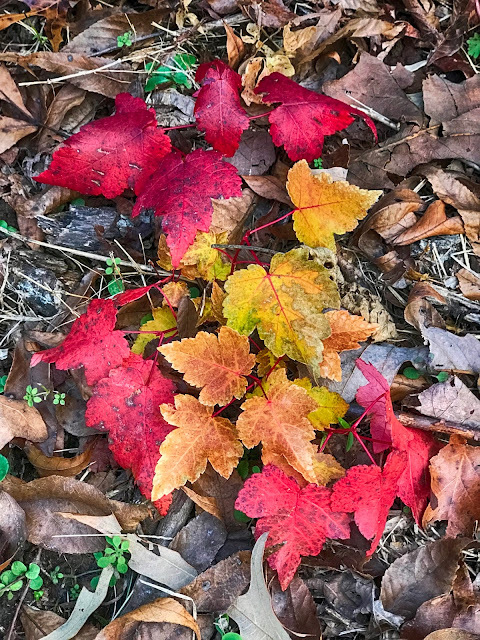 Just as I'd written off fall color, I came across a tiny patch of color behind the barn. It caught my eye as we walked yesterday. The poplar and hickory trees are raining coco brown leaves that crunch underfoot. I think these are tiny oaks but I could be wrong. Some time studying the foliage around here would be time well spent. But for now, let me just call them beautiful. NOTE: some of you ask that we post the youtube of Christmas of My Dreams. Okay I'll call them beautiful because they are. The song is very pretty. I downloaded it. Do I pay you for it now? Love those jewels - and your song. They look like maples to me, and they are beautiful. The leaves came off a Christmas tree, I KNOW! The color is very good. Nice to see a bit of color these days, Only color here is on the Christmas trees. I think the leaves are Maple leaves too. Thanks for the link to the Christmas of my Dreams. It sounds lovely and so is Jilda's Christmas card. I love Jilda's voice; it's so warm. I could listen to her for hours!! The song is great. The leaves are falling from the tree in my front yard. They're all the same exciting shade of brown.